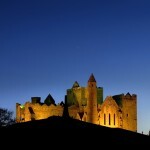 This Romantic tour is a 7 night tour which travels to Irelands most romantic locations. Spend your Honeymoon in Ireland. This Romantic Ireland tour includes smaller towns and villages in the west of Ireland, each one famous for its cozy, atmospheric pubs and great restaurants. Your route will take you along spectacular coastal and lake-land locations and includes Ireland’s most popular sights including The Rock of Cashel , Kilkenny Castle and Kinsale in County Cork, Killarney and the Dingle Peninsula in County Kerry, the Cliffs of Moher and the ‘Burren Landscape’ of County Clare as well as the Aran Islands and Connemara in County Galway. This tour is based on arriving and departing through Shannon airport however it can be amended to other access points. Not looking for a bus tour Ireland/holiday to Ireland? Check out Let’s go Travel and Limerick Travel for options to other destinations! Your first overnights accommodation is reserved for you in Killaloe, Co. Clare. From Shannon take the N18 and follow the signs for Limerick. Time permitting, visit Bunratty Castle and Folk park situated 8kms from Shannon enroute to Limerick. Built in 1425 Bunratty Castle has the finest collection of medieval furniture in the country, which brings to life a vital part of the Celtic past.Within the grounds of the Castle is Bunratty Folk Park where 19th century Irish life is vividly recreated. Set on 26 acres (10.5 hectares) the Park features over 30 buildings in a ‘living village’ setting. A restored village street complete with pub, post office, school, doctor’s house, hotel and various shops provide the main focal point of the park. On arrival in Limerick follow the N7 for Dublin, pass the villages of Annacotty, Lisnagry and Birdhill. After Birdhill turn left where you see the signpost for Ballina. Turn left in Ballina and cross the bridge – arrival Killaloe. Killaloe / Ballina is situated on the banks of The River Shannon, approximately one Kilometre below Lough Derg, nestled between the Slieve Bernagh mountains of Clare and the Arra Mountains of Tipperary. The twin towns of Killaloe & Ballina are one of Irelands most picturesque attractions. The two towns are linked by a bridge across the River Shannon, linking not only two towns, but two counties, as Killaloe is in Co. Clare, and Ballina is in Co. Tipperary. Commanding an important ford on the Shannon, Killaloe has been a place of strategic importance for thousands of years, but is probably best remembered as the home of Brian Boru, the High King of Ireland, 1002 – 1014. His victory over the Vikings in Clontarf in 1014, signalled his death, after he himself died in his hour of Victory. At the height of Boru power Kincora was a massive fort rich in wealth and harvest and became the centre of authority and capital of Ireland. Both Killaloe and Ballina are equally blessed with fine pubs and restaurants and most of the public houses provide excellent bar food too. There are music sessions in the pubs some impromptu, some organised in advance. By night Kilkenny comes alive as visitors and locals alike enjoy the city’s vibrant cultural and entertainment life. The city offers an eclectic mix of cosmopolitan designer bars, and traditional old style hostelries. What better way to spend an evening than enjoying a romantic candlelit meal in one of the many restaurants throughout Kilkenny? Live music and theatre takes place throughout the week, so whether your taste is for dance music, poetry, theatre or rock! 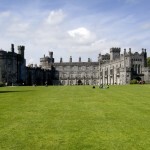 – Kilkenny has something to offer you. Depart Kilkenny for Waterford. Waterford is the oldest city in Ireland and has a history of continuous habitation since 914. The imprint of the early Viking settlers can still be traced in the street patterns of the city’s Viking Triangle. The parameters of the expanded Anglo-Norman city are marked by the circuit of medieval towers and walls that still stand in many locations. Great public buildings of finely cut limestone and warm red-bricked merchant houses are expressions of the grandeur and elegance of the 18th century, while today the city responds to modern demands with sophisticated shops and malls, a vibrant nightlife, a range of excellent restaurants and bars and superb sporting facilities. Visit Waterford Crystal – The Waterford Crystal story first begins in 1783 when George and William Penrose founded their crystal manufacturing business in the busy port of Waterford. They seized on the opportunity to produce “plain and cut flint glass, useful and ornamental” in their factory, which was situated in the heart of Waterford city. It was the enterprise and skill of these founders and their successors, which had such an impact for generations to come on the appreciation of glass, which is stronger today than when they began two centuries ago. Travel onto Kinsale which is 28.5 kms from Cork city. For centuries, Kinsale(meaning Tide Head) has been a haven from the sea for travellers and traders alike. Their influence has made Kinsale the most cosmopolitan and charming parts in Ireland. Kinsale owes its unique character to the fact that it was a garrison town and port of consequence for over 300 years, hence its magnificent Georgian houses and the Dutch influence of its architecture. It was also in the days of sail, the natural landfall for all ships from the continent and the Americas. Not only does this town lay claim to being the oldest town in Ireland, but it is also renowned internationally for the number and quality of restaurants in the town. It is hailed as the Gourmet capital of Ireland. Time permitting why take a trip to the Old Head of Kinsale for magnificent cliff scenery. It was off here that the Lusitania was sunk in 1915 with a loss of over 1,500 lives. Today you have the option of the scenic but longer coastal route or the shorter route via Blarney Castle. The longer route includes visits to Mizen Head, the southernmost point in Ireland, as well as Bantry House and Gardens and the French Armada Centre, also in Bantry. From Bantry, you will be heading north to Killarney via the Healy Pass. Have your camera’s at the ready for some breathtaking scenery across the Caha Mountains that divide Cork from Kerry. After the mountain pass, you come to the town of Kenmare. The town was founded in 1670 by Sir William Petty and has a history of lace making, demonstrations of which can be seen at the town’s Heritage Centre. The alternative route for todays journey is a shorter one. First stop is the famed Blarney Castle where a climb to the ramparts to kiss the Blarney Stone is said to bestow the gift of eloquence, otherwise known as ‘the Gift of the Gab’. From there it is straight to Killarney. With its three famous lakes and majestic mountain ranges, Killarney has been the inspiration of poets and painters over many centuries. The Killarney National Park is internationally renowned both for its scenic beauty and scientific interest. There are many walks and trails around Killarney including a 2-hour tourist trail around the town itself. You will also have a chance to visit Ross Castle, the Gap of Dunloe or simply take a stroll through the streets of this quaint town to enjoy the great pubs and enjoy the traditional Irish music on offer. From Killarney take the N72 towards Killorglin. Approximately 2 miles (3km) from Killarney take a right turn onto the R563 signposted to Milltown and Castlemaine. Take a left in Castlemaine village square following signs to Dingle. The early part of the drive may seem uninteresting, but soon changes as you pass through the tiny village of Boolteens, and views of Castlemaine Harbour open up on your left. The fuchsia lined route pushes on between the Slieve Mish Mountains and the sea until you reach Inch, one of the most beautiful beaches in Ireland. At low tide it is possible to drive down onto the sand, but make sure you keep away from the soft sand near the magnificent dunes. There is also limited parking available on the roadside overlooking the beach. Continue west along the coast road via Red Cliff to the village of Annascaul. This small village is the birth place of Jerome Connor, the famous sculptor, and Tom Crean, a local hero who accompanied Scott and Shackleton on three Antarctic expeditions, including Scott’s doomed attempt to reach the South Pole. On his return to Annascaul Crean opened the “South Pole Inn”, which is still in business today. Leave Annascaul on the N86 heading directly to Dingle. Surrounded by hills on three sides, the harbour town of Dingle is one of the world’s natural beauty spots. It’s a lively and attractive place with a picturesque harbour, brightly painted buildings and lots of pubs with live music. Continue your journey via the Conor Pass to Castlegregory a small village located on the north side of the Dingle Peninsula, halfway between Tralee and Dingle. Continue your journey on the R560 to Camp and Blennerville. Time permitting take in a visit of the Blennerville Windmill Laneville, built in the 18th century is Ireland´s only commercially operated windmill. It is also the tallest of its kind in Europe: 21.3 metres high. Return to Killarney. No visit to Killarney would be complete without a visit to Muckross House and gardens. Situated in Killarney National Park, Muckross House and Gardens are among the most popular of Irish visitor attractions. Queen Victoria paid a visit here, to the Herbert family, in 1861. The House was later owned, in turn, by Lord Ardilaun (of the Guinness family) and by the Bourn Vincents. Today, many of the rooms in this magnificent mansion have been restored to their original Victorian splendour. Muckross Traditional Farms are situated adjacent to Muckross House. These working farms recreate and portray the traditional farming methods, and way of life, of a typical local, rural community of the 1930s. Leaving Killarney, head for the Killorglin infamous for the Puck Fair which occurs every year around the 10th -12th August . This is a pagan festival dating back 3000 years, Where else but in Ireland would a wild mountain goat be crowned King and reign over a town for three days?! Next stop is Rossbeigh beach, which is 3 miles of a beautiful sandy beach located in Glenbeigh . From the mountain stage there is a great view of Dingle bay, this is a good spot to stretch your legs and enjoy the view. Caherciveen is next, the birth place of Daniel O’Connell ” The Liberator” and hero to the Irish people in the 1800′s. It is also home of two stone forts dating back to the 9th Century. Leaving Caherciveen on your right hand side you can see Valentia Island. Valentia island, a place of unique scenic beauty, tropical vegetation, breathtaking cliffs and magnificent seascapes, can be accessed via a bridge from the fishing village of Portmagee. At the point where the bridge meets the island you will find the Skellig Experience Visitor Centre. The centre interprets in a lively and non-academic way the life of the early Christian Irish monks living in the island monastery of Skellig Michael, a small island 8 miles (14km) off the Kerry coast. Valentia was where the first Transatlantic Cable was laid all the way to America in 1857, you can also visit the Slate Quarry and the Light House, there are many remains of old structures including Stone Forts and Churches. From there drive back to the main road and head across the headland to Waterville. Continue along the coast road over the Coomakista Pass where there is a viewing point at 700ft (225m) above sea level affording spectacular tours. Travel on through Caherdaniel and Castlecove to Sneem, a past winner of the National Tidy Towns Competition. For a side trip look out for signs for Staigue Fort approximately 2.5 miles beyond Castlecove. The fort is probably the finest example of a stone fort in Ireland and is about 2,500 years old. It is built of stone common to the district and is almost circular. The final leg of the tour takes you through some of the most stunning scenery. From Sneem you drive through Parknasilla and Tahilla to Kenmare and then up the mountain road to Moll’s Gap and Ladies View where you will be treated to unrivalled views of the Killarney Valley. Follow the signs for Tralee (N22) via Farranfore. In Tralee take the N69 to Tarbert via Listowel. Tarbert is 77kms from Killarney. Here you will take the ferry to Killimer. Take coast road to Kinvara via Cliffs and Burren etc. Kinvara is a beautiful fishing port village located 18 kilometres south of Galway city in the west of Ireland. It is acclaimed for its scenic beauty and tranquil atmosphere. Kinvara has long been a gathering ground for many artists and musicians. Irish music and dancing are played regularly in the local bars. Kinvara is located close to the famous Burren landscape full of wild flowers and limestone mountains. 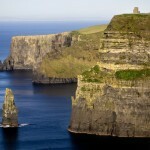 It is only a short drive to many other famous attractions such as the cliffs of Moher and the Ailwee caves. Kinvara, the name, has been anglicized, the name of the village in Irish, being Cinn Mhara. Translated into English, this means Head of the Sea. This name gives one, a very good insight into Kinvara’s history. Essentially, Kinvara has grown into what it is today, from its association with the sea. Dunguaire Castle: – Probably, the most famous land mark that is associated with Kinvara, Dunguaire Castle is a small 17th century castle on a rocky promontory, situated just outside the picturesque village of Kinvara on the shores of Galway Bay. This castle was built 500 years ago in an inspirational place commanding the shores of the majestic Galway Bay ~ situated 300 yards outside Kinvara Village. It is famed in song and story even this day. The castle is 500 years old and in that time has had a chequered history. DAY 8 Travel to airport for flight home. This iconic location attracts close to one million visitors per year. The unusual, underground visitor centre also houses the exciting Atlantic Edge display. This huge, domed cave contains images, exhibits and displays. The centre also has a gift shop stocking official Cliffs of Moher products, maps, guides, books and DVDs, visitor information and an accommodation booking service. Other facilities of this fully wheelchair accessible premises include a baggage store and ATM. Friendly staff will answer questions, provide assistance, give information on and directions to other attractions in the area.A 12th century castle remodelled in Victorian times and set in extensive parklands which was the principal seat of the Butler family, Marquesses and Dukes of Ormonde. Due to major restoration works, the central block now includes a library, drawing room, and bedrooms decorated in 1830’s splendour, as well as the beautiful Long Gallery. A suite of former servant’s rooms is the Butler Art Gallery, which mounts frequently changing exhibitions of contemporary art. The Parade Tower is the Castle’s conference venue. The Cliffs of Moher, one of Ireland’s top visitor attractions, loom high over County Clare’s west coast. Standing 214 metres at their highest point, the cliffs stretch for 8km along the Atlantic coastline. From the cliffs, one can see the Aran Islands, Galway Bay, The Twelve Bens, the Maam Turk Mountains in Connemara and Loop Head to the south. 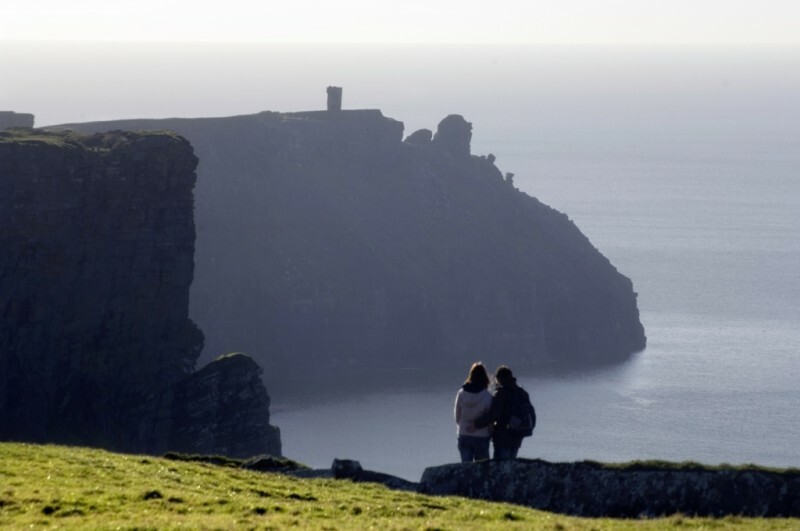 O’Brien’s Tower, another of Ireland’s most photographed landmarks, guards one prominent headland of these majestic cliffs. The Burren and Cliffs of Moher region of north Clare has been awarded the prestigious designation of membership of the UNESCO supported Global Geopark network at the 10th European Geoparks Conference in Langesund, Norway. This iconic location attracts close to one million visitors per year. The unusual, underground visitor centre also houses the exciting Atlantic Edge display. This huge, domed cave contains images, exhibits and displays. The centre also has a gift shop stocking official Cliffs of Moher products, maps, guides, books and DVDs, visitor information and an accommodation booking service. Other facilities of this fully wheelchair accessible premises include a baggage store and ATM. Friendly staff will answer questions, provide assistance, give information on and directions to other attractions in the area. The Rock of Cashel is on a rocky plateau that rises 300 feet above the surrounding plain known as the Golden Vale of Tipperary. The name Rock of Cashel comes from the Gaelic “caiseal” which means “stone fort,” and it has been a known fortified position since the forth century of the Common Era. From this promontory much of Country Tipperary is visible for miles, making it an ideal place for a fort or strong hold owing to the fact that a defender could see an enemy force approaching from any direction. Today, the visitor turning away from the magnificent view comes face to face with a maze or labyrinth of the remains of an ancient church open to the sky and weather, foundation stones of old buildings, tombstones, a ninety foot high stone tower and archways leading nowhere. Although occupied since the fourth century, the visible ruins that one sees today only date to the twelfth and thirteenth centuries. The oldest edifice on the Rock that is still standing is a round tower of fitted stones, without mortar, built in 1101. Recently the base had to be reinforced with mortar to stabilize it. Such towers, which can be seen throughout Ireland, served as both watch towers and shelter from Viking raiders. The first floor entrance, reached by a ladder which could be pulled up in the event of attack, was twelve feet above the ground.